It's been a while since I've been able to post for three days in a row. To do that requires time in the sewing room and progress on multiple projects. Up until this last weekend, sewing room time had been a bit scarce. Thankfully the shoulder problems that kept me from stitching are abating and I can enjoy both sewing and blogging again. And here's what I've gotten done so far on Block 6, the first step in the mystery. 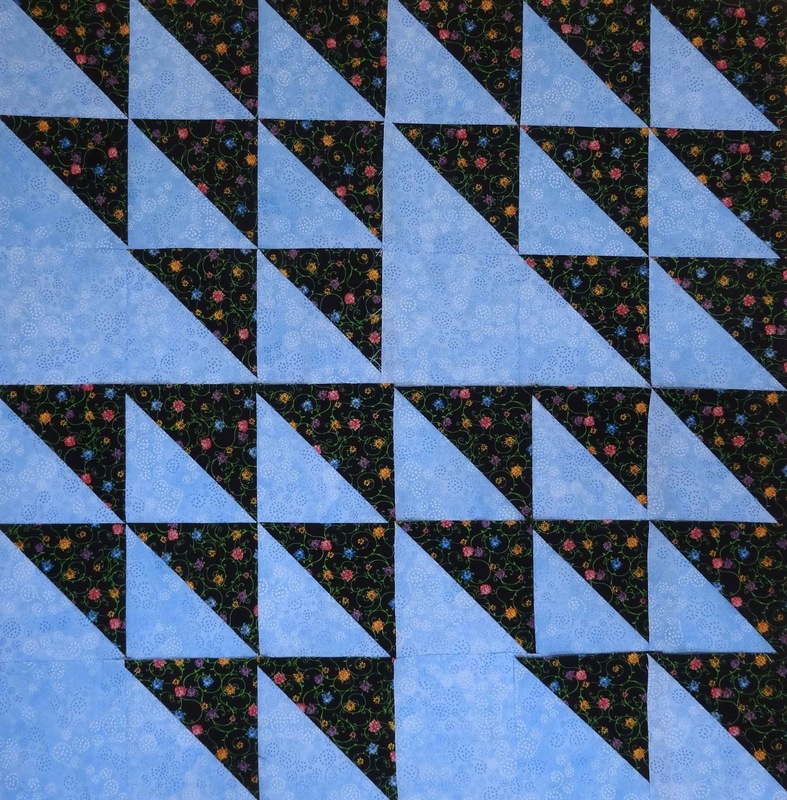 I've got all the HSTs made, but the blocks aren't all sewn together yet. There's another set of HSTs that need to be made this month, I should get started on those before the next set of instructions come out. So I'll likely be a bit behind, but that's OK. These are 4.5" HSTs so they go pretty fast. Linking up with Let's Bee Social and Needle and Thread Thursday. Just a few days and the end of September will be here. Hard to believe that it's almost the start of the last fourth of the year. Since it's the end of the month, it's time to contemplate success or failure with this month's One Monthly Goal. 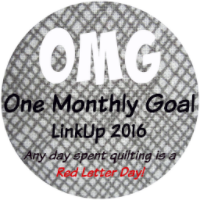 The end of the month link up is up over at Heidi's Red Letter Quilts. 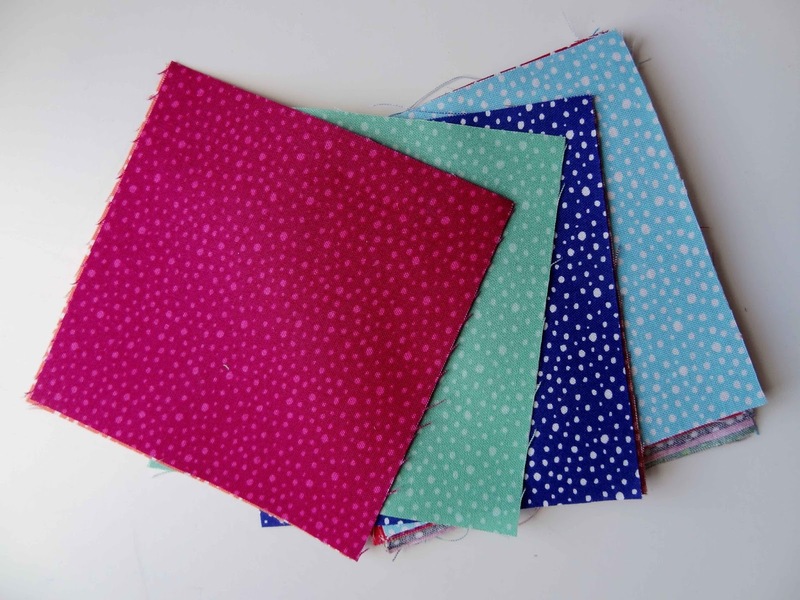 I started struggling with shoulder problems the end of August, so in picking a goal for September the thought was to go for something pretty easy since sewing time might well be non-existent if the shoulder didn't get better. Unfortunately, that turned out to be truer than I had hoped. Not much stitching got done early in the month. My goal was to get started on the next graduation quilt, Bejeweled. Bejeweled by Susan Guzman in "All About Strips"
I mark the start of a quilt as the date the fabric starts being cut for the project. So this month's goal was just to get started on cutting out a few of the pieces. I met that goal and even made some progress on getting a few of the initial blocks sewn. I need 36 of these Economy Blocks for the quilt. Only 12 more to finish. So that's a good start considering how little sewing time I've had this month. Bejeweled is also doubling as my new Let's Book It project. 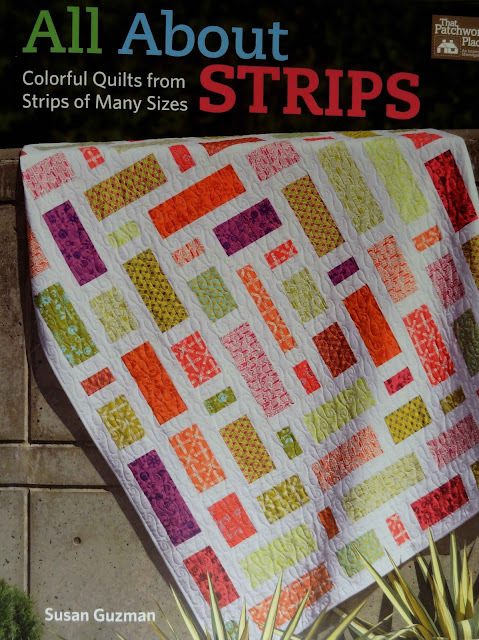 The project is from Susan Guzman's book "All About Strips". 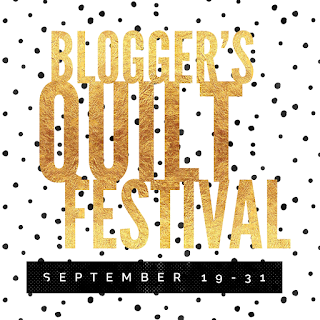 I'll be linking up with Sharon at Vroomans Quilts once she has this month's linky party up. We had a rainy Sunday and now it's a chilly Monday. Getting out of bed this morning was hard. Even more so because I got to take last Friday off. Since sewing doesn't bother my shoulder, I did a lot of that this weekend. Friday was spent prepping Zombies in Paris for shipping out to Trudy for quilting. It's all pressed and packaged, ready for mailing at lunch today. 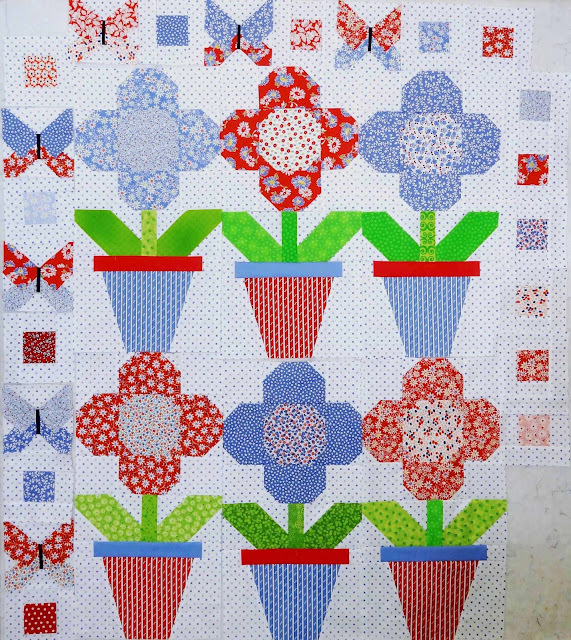 Since the backing for the Zombie quilt is now off the big design wall there was room to move Blooms and Butterflies off the small design wall. By the end of the weekend all the Back Porch Bloom blocks were sashed together. There was also room to lay out the blocks for the pieced border to determine what colors are needed to be cut. Only two more red bordered squares are needed, but I need 4 blue squares and 12 more butterflies. 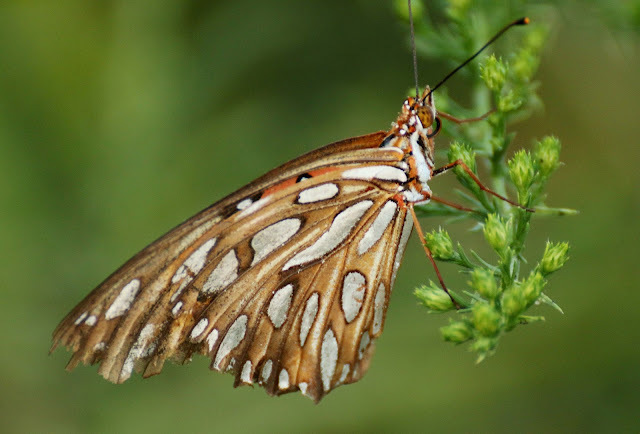 The bordered squares and butterflies are my current leaders and enders project. 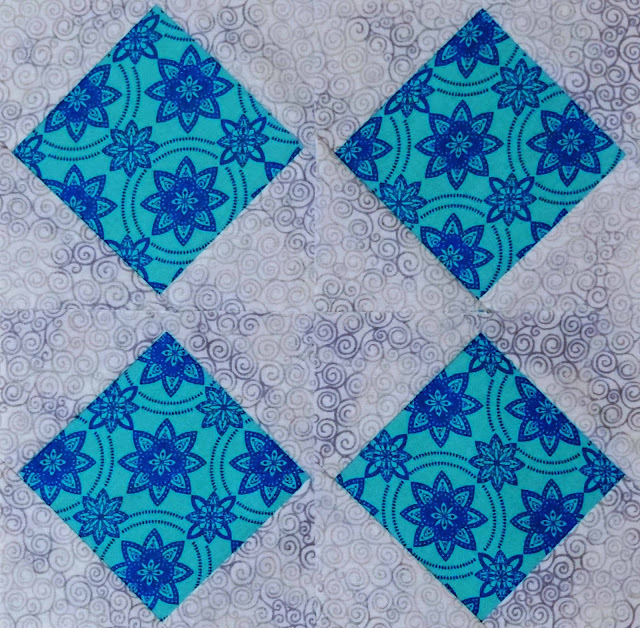 There's a blue border next, then another blue dotted border before the pieced border will be added. So I've still got some time before moving those blocks up in the assembly line. Once I do that, then I'll need a new leaders and enders project. Hmm, I'll have to give that some thought. The small design wall didn't stay empty for long. But now it's time for work, so I'll just have to share those pics for later. It's been a rough week. My shoulder continues to be a royal pain, quite literally. It's the home computer that seems to be the biggest trigger (I have an ergonomically designed computer station at work, hence no problems there). The doctor suggested isolating my activities, work on the computer for a couple of days with no sewing and vice versa. I can sew for hours with no problem (thank goodness), but I'll pay for an hour on the computer for the next day. Since the computer at work is no problem, it has to be my set up at home, which is pretty hap hazard. Definitely no typing sitting in the recliner with the lap desk and no working at the dining room table. Standing at the kitchen table works well (we have a high top kitchen table). I'm trying the writing desk this morning. So there's been lots of sewing, a bit of blog reading, but I'm not leaving a lot of comments these days. Thankfully, I have been able to sew. Though the doctor had me lay off all of my activities for a couple of days to let the medication work and get the inflammation down. So it wasn't a perfect week of getting into the sewing room each day. If I can find time to sew for 15 minutes just 4 more days this year, I'll exceed my sewing days for last year. It wasn't my worst year for finding time to stitch, but it wasn't my best either. Stash management was interesting this week. I've had a run of luck the last month and have been the lucky recipient of several give aways. Preeti of Sew Preeti Quilts celebrated her 101th post with a give away back in August. A Connecting Threads Quilting Candy charm pack showed up this week. 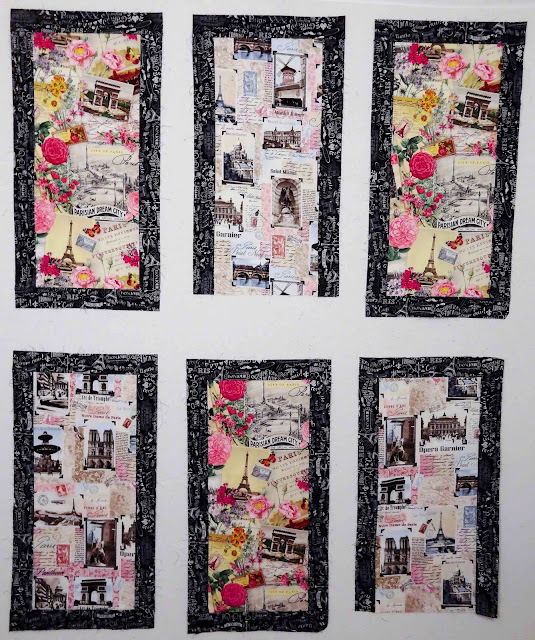 Lea Ann Brumment who blogs at Podunk Pretties was sponsoring a quilt along featuring her very fun and pretty Back Porch Bloom block. Unfortunately her mother's fight with cancer needed addition resources and Lea canceled the rest of the quilt along, but was very generous in awarding me the rest of the prizes for being the only one who linked up in August. There was a lot in that package. A charm pack of Farmhouse, a Windmere Jolly Bar, a Moda scrap bag of 2.5"strips, another set of strips from Kaufman fabrics and some fun scraps. There was also a pattern for Eleanor Burns' Egg Money Quilts Sampler, plus a book "A Spoonful of Sugar" by Lisa Cox. Please keep Lea's mom in your prayers. So the stash report ends the week in the black. But I got the urge to do some stash refreshment before all my goodies starting showing up. That's not here yet, but I best get sewing or next week's report will be in the red! 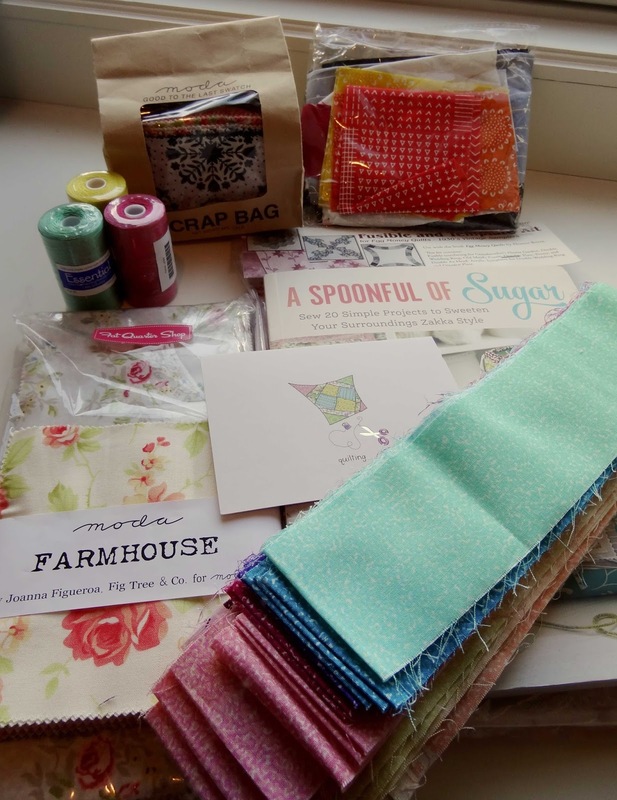 Linking up with Patchwork Times for the weekly stash update. Not much happened in the sewing room on Saturday. We attended the company picnic for most of the day, then napped the rest to recover from the fall pollen. I love autumn weather, but my allergies certainly don't. Sunday turned out to be a good day for stitching. The backing for the Zombies in Paris was finally finished. The back uses up two of the fabrics that didn't get used on the front. I like the large panels. It was a little more work to piece, but if DT's friend decides she wants to present a less silly side to the world, then she can use this side. Just for reference, here's the front. Hopefully she'll like both sides. Now all that's left is to press both the top and backing, as well as clean up any loose threads. I probably won't get that done till next weekend. Still it's nice to have this one just about ready for quilting. 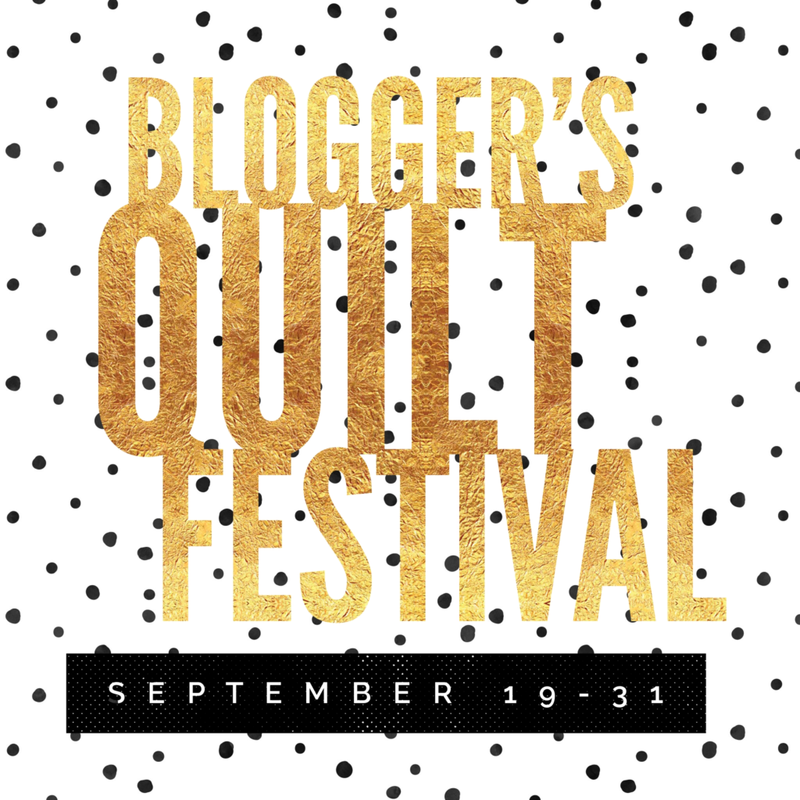 It's time again for the Fall Bloggers Quilt Festival hosted by Amy Ellis of AmysCreativeSide. It wasn't hard to decide which quilt to enter, but it was a bit hard deciding which category it fit best in. 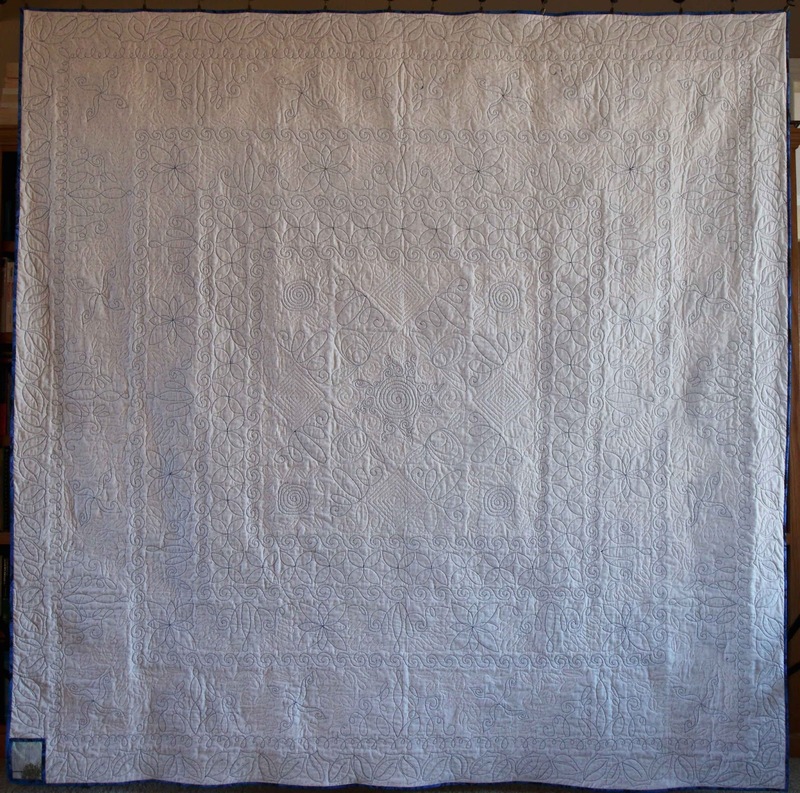 I finally decided that the Large Quilt Category fits best for my quilt, Lily Pad. 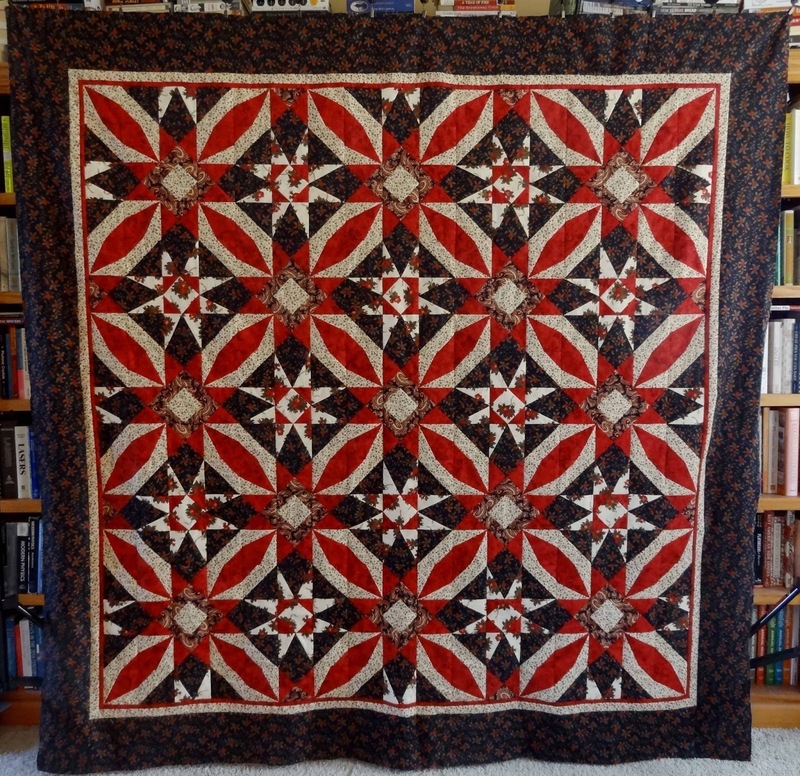 The quilt was started in 2013 as part of the Back to Square One quilt along sponsored by Judy Laquidara of Patchwork Times. The pattern is still posted on Judy's blog, but you'll have to search for the individual posts as she doesn't have this one on her patterns tab. It took about two and half years to finish it. Drama Teen early on said that the colors reminded her of a lily pond with the blues, greens and whites. That's the name that stuck. 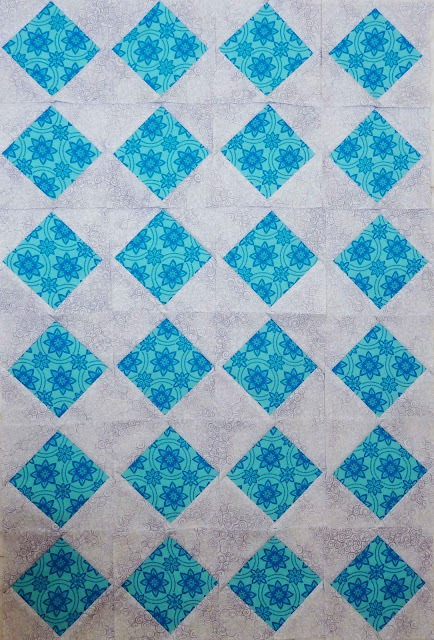 Trudy Lindemann did the quilting using blue thread. It looks like a whole cloth quilt from the back. The quilt is 84" on each side. The quilt became a late Christmas present for the family that hosted a writing workshop DT attended in the summer of 2015. DT "met" the oldest daughter while participating in an on line creative writing class. Four of the girls from that class have meet weekly using various on line meeting platforms since the fall of 2012. The 2015 writing workshop was the first time three of them met face to face. I tagged along as chaperone and chauffeur. 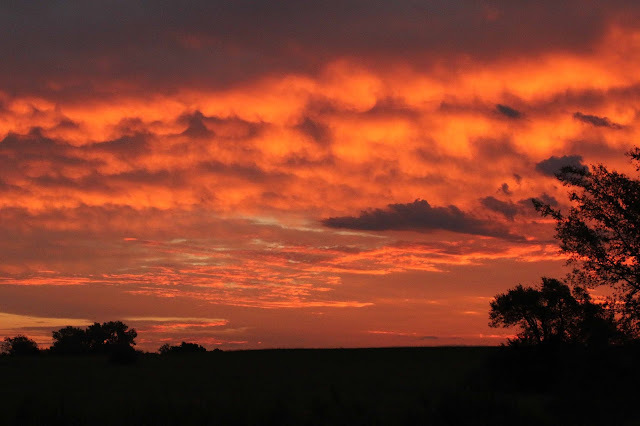 One of the advantages of walking early in the morning, besides the fact that you can mark it off your list for the day, is the gorgeous sunrises you can witness. This morning's was pretty spectacular. It wasn't a very sunny week, outside or inside. The shoulder pain returned this week, limiting both computer time and sewing time. Thankfully it was feeling better by Friday, so I was able to get in at least my 15 minutes of sewing time for the last couple of days. I've been working on adding borders and making a backing, so the outgoing stash number still looks pretty good. We'll see how things look next week. The urge to do some stash refreshing was to big to resist. All I can say is that Connecting Threads needs to slow down on introducing such pretty new fabric lines. Plus, I've had a run of luck with blog drawings lately. I'm sure there will be some stash additions on that front soon too. It's been a frustrating week, the shoulder pain came back on Monday, so there's been no sewing since the weekend and almost no computer time. The shoulder is better now, so I'm hoping to get some sewing in this weekend. But I'll still be limiting computer time, that seems to be the trigger. I'm way behind on answering emails and reading blogs. I'm going to concentrate on answering emails and then catch up on reading blogs, but I'll probably be pretty stingy with comments. Typing on the computer seems to be the biggest trigger. Hopefully the doctor can offer some alternatives, there's probably some physical therapy looming in my future. Not being in the sewing room has hampered progress on the Vintage Dresses. I'm still working with last month's grays. 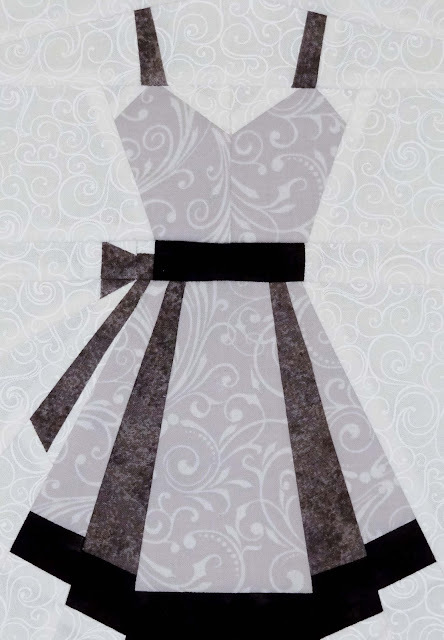 One of the gray dresses was finally finished last weekend. It's not as bright as the others, but I still like it. The light gray in the dress isn't my original pick, that fabric didn't have much contrast with the white, so I went back and found this that was just a couple of shads darker. The second gray dress is still in pieces. It will be a lot darker. As far as this month's color of garnet, I hope to get some fabrics picked for those dresses this weekend. It was a nice relaxing weekend. Some much needed yard work got done on Sunday, which has unfortunately left me a bit sore this morning. There was lots of stitching time this weekend, but it sure doesn't look like much when you look at what's up on the design wall. Good progress was made on piecing the backing for the Zombies quilt. All that's left is the borders to bring it up to size. Hopefully this quilt will be ready to send out for quilting next week sometime. The other blocks up on the design wall are from the second graduation quilt, Bejeweled (my EQ version is here). Drama Teen selected the swirly gray background. I wasn't sure it was going to to work, but it looks fine. I've got 32 more of these Economy blocks to make, then there are 36 more in another color to construct. The goal this month was to get started on it, which in my book is when I start cutting the fabric. 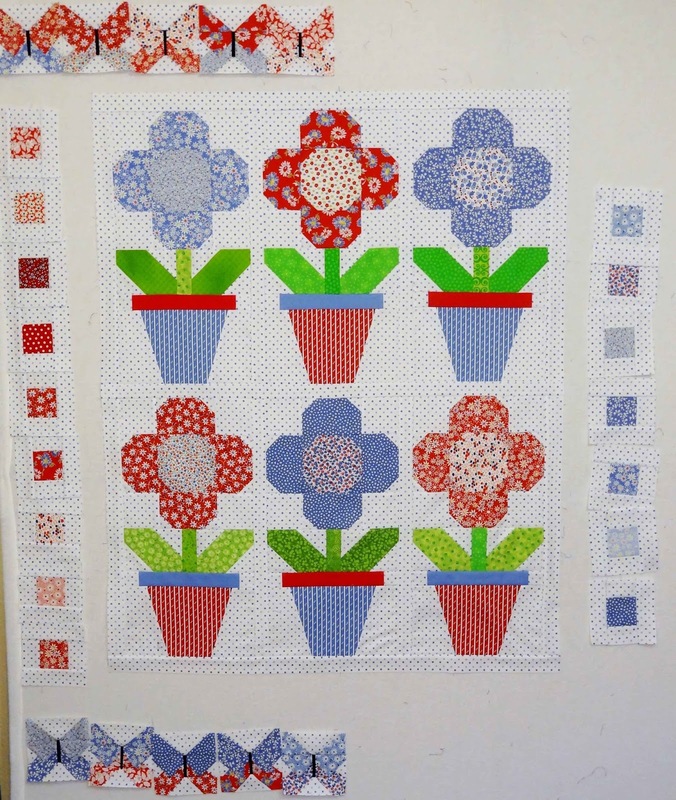 I'm looking forward to making this quilt. It uses a lot of bright and fun fabrics, with lots of blues. It's been a nice weekend. A relaxing one which is a welcome contrast to our busy week. Drama Teen and I drove to Tulsa on Thursday to meet with a representative of one of the colleges she's considering attending and then had dinner before heading home. I'll have to spend some time this afternoon going over her applications so she can get them sent in. I still hope to get in a bit of stitching time though. It was a good week for stash busting. Finishing the borders on the Poinsettias quilt and making a backing for the Zombie quilt really helped with moving fabric to the out column. By the time I finish the backing for the Zombie quilt I should have used more fabric than I did last year. Which is good because I've added more this year than I did last year. The schedule this week meant I missed getting in my 15 minutes of stitching time a couple of nights, but it still wasn't a bad week. I'm doing much better on getting into the sewing room than I did last year. Maybe that's because I have some hard deadlines for a few quilts next year. In addition to spending more time in the sewing room this year, I've been walking a bit more. This little lovely made my evening last week. Linking up with Patchwork Times and then I'm off to take advantage of the cooler temps do yard work for a bit. Starting the work week on a Tuesday always gets me out of wack with my days. We had a good holiday weekend, though we didn't really do much, which seemed to work well for all of us. My shoulder is doing much better. I still have to watch my computer time, but I can sew without pain now. Which made for a very fun weekend in the sewing room. Monday afternoon, the final two border strips were added to Poinsettias, finally moving that project to the finished flimsy stage. I'm really happy with how this quilt turned out. Poinsettias started out as a leaders and enders project in 2014. 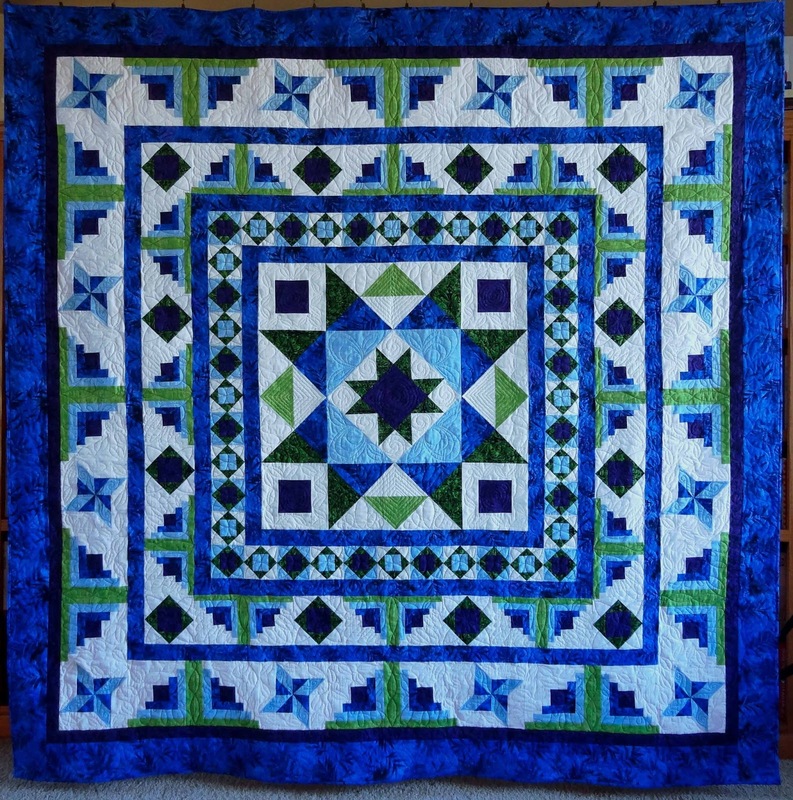 There are 289 pieced 4.5" squares in this quilt. Making this my leaders and enders project was my compromise to allow me to start on this project, but still put the focus on those projects that needed to get finished. The fabrics are Moda, I don't remember the line now, but they were purchased when we lived in Texas, so they are at least 10 years old. I have the backing fabric picked out, but piecing the back will have to wait a bit. Not much has changed since 2014, there are still other projects that have deadlines on them. 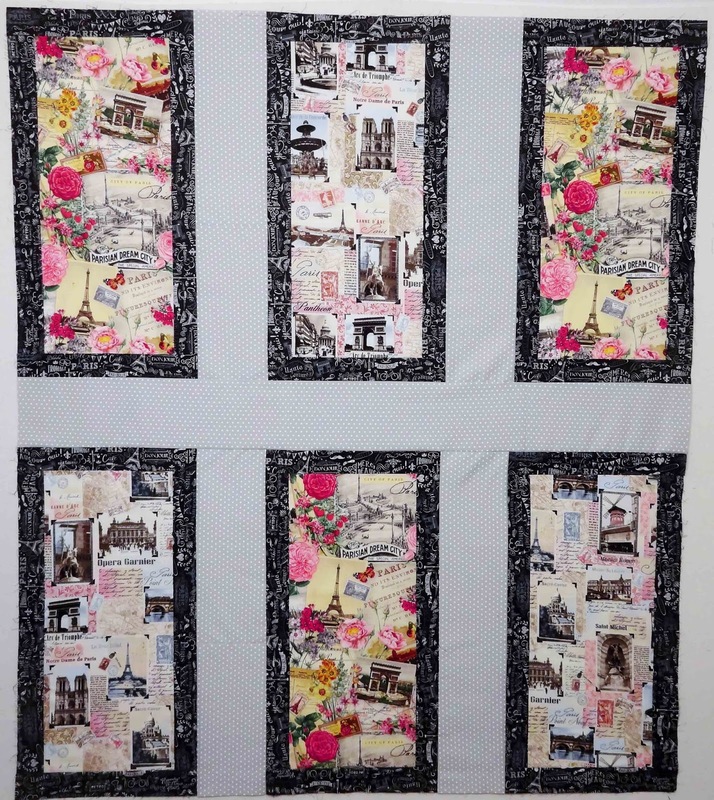 So for now piecing the back for the Zombies in Paris quilt needs to come first. These panels make up the center of the back. There's not enough of my backing fabric to cover the whole back, but adding these 6 panels makes it all work out. These fabrics were purchased when Drama Teen and I were working out the quilt design for this project, but they didn't make the final cut to be used on the front. It's a little more work to make a pieced back, but since this is a gift, the extra effort is worth it. Happy Labor Day to those in the US. Hopefully you are off work and have plans to hang out with family or spend some time in your sewing room. My plan is to do a bit of both today. It was nice to get back into the sewing room after being sidelined for most of last week with my shoulder. I've been piecing the back for the Zombies quilt and finishing the Back Porch Bloom blocks for Blooms and Butterflies. 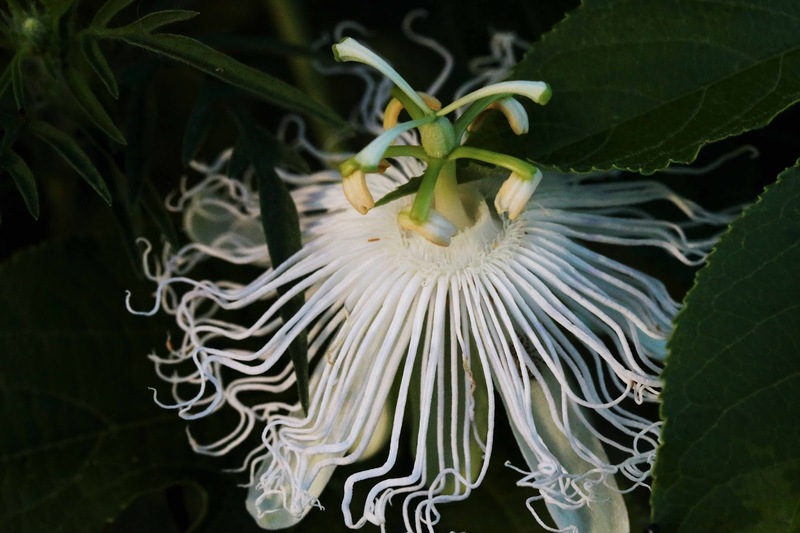 The last of the six blooms has been stitched together. After a bit of fiddling a final layout was decided and I started stitching the leaves to the pots and the blooms to the leaves. This is where I left it last night. A few more butterflies and squares for the second border have been added as well. The square in a square and the butterfly blocks have been my leader and ender project for the last few weeks. I'm really happy with how this one is coming together. It's a great way to move those 1930 reproduction prints out of the stash. 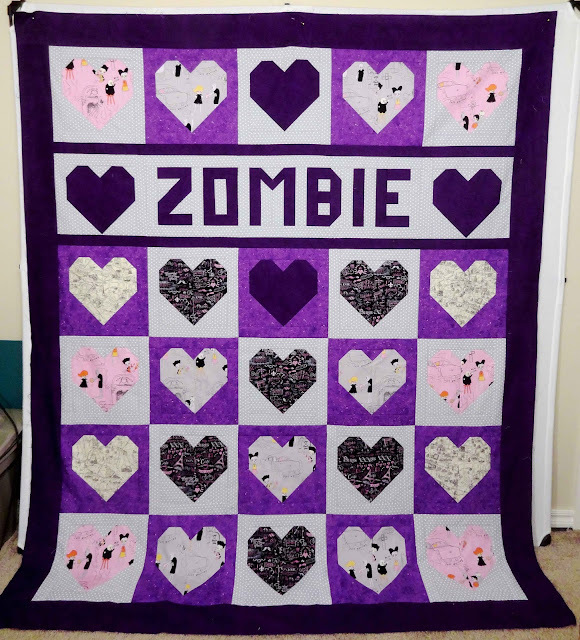 I'm hoping to get the center assembled today and make more progress on the back for the Zombies quilt. It was a slow week in the sewing room. A lingering shoulder injury made doing much of anything just not fun. Thankfully the shoulder was feeling much better yesterday, so I'm hoping to get some time in the sewing room today and tomorrow. However there's not much movement on the stash this week, well least not going out. I almost forgot about the 4 fat quarters that came home yesterday. No photo because I'm not sure where they ended up after our shopping trip yesterday. The shoulder problem didn't keep me out of the sewing room or off the computer completely, but I had to limit my time just 15 minutes each day. I got some cutting done and finished selecting the fabrics for Bejeweled. It's amazing how just 15 minutes a day helps keep projects moving. That's pretty much it for the stash report this week. I'm linking up with Patchwork Times as usual. If that's what you came for you can stop now. 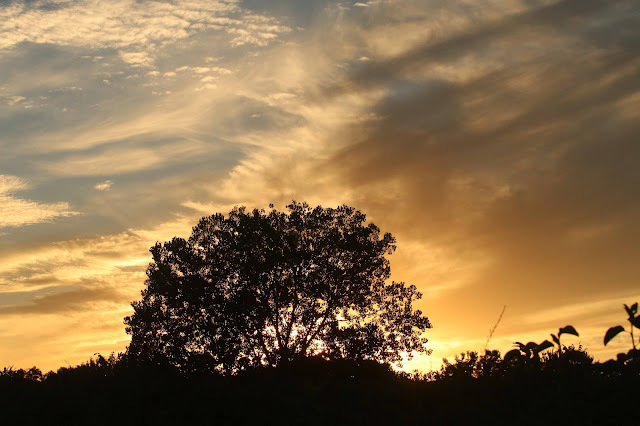 The weather here has been gorgeous for the last couple of weeks, very productive to some long walks with the camera. 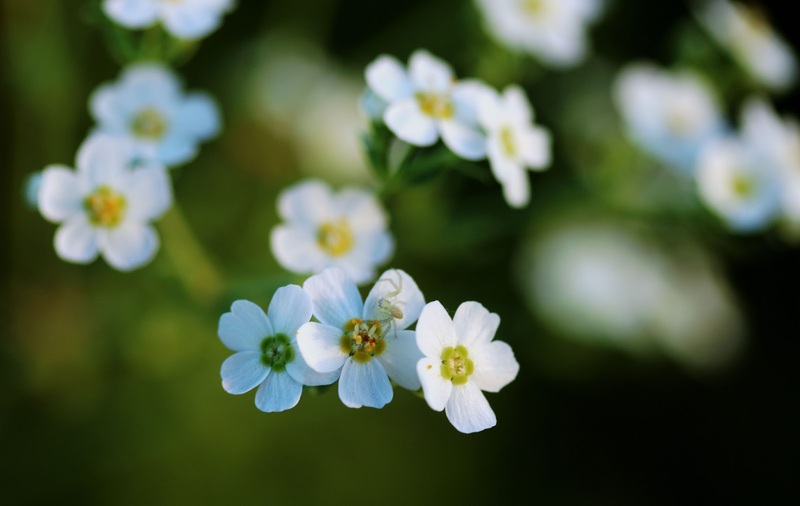 With all the rain, things here are still green and the wildflowers are still blooming. 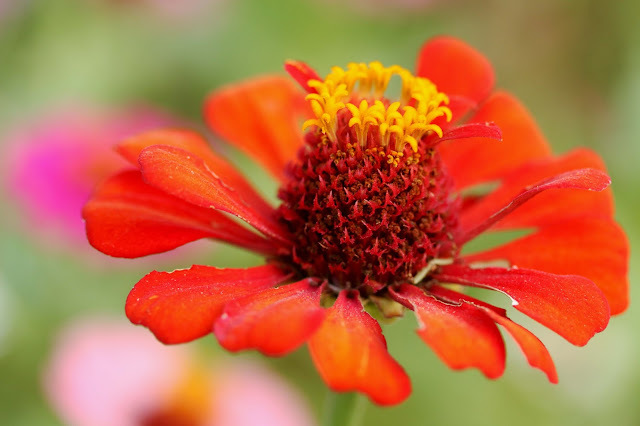 Here's some of the late summer pretties that are blooming. For those in the US, have a great Labor Day. Hope you get in lots of family and stitching time. Hard to believe it's already the first of September. Unfortunately the last week of August wasn't fun, no computer time and no sewing since Sunday afternoon. It wasn't a case of being too busy. My left shoulder has been acting up, to the point that I've had no feeling in my left hand and severe pain in my shoulder. It's a muscle/nerve problem caused by an old injury. After several days of alternating muscle relaxants and anti-inflammatories, I finally have feeling in my left arm and no pain in my shoulder. Hopefully this weekend I'll have a chance to get caught up on answering emails, reading blogs and get in some good sewing time as well. I'm glad that August's One Monthly Goal was finished early, if I'd waited till the last minute, it wouldn't have gotten done. Now it's time to decide what goal to pick for September's One Monthly Goal. I've got lots on my to do list for September so it's hard to decide what to focus on. 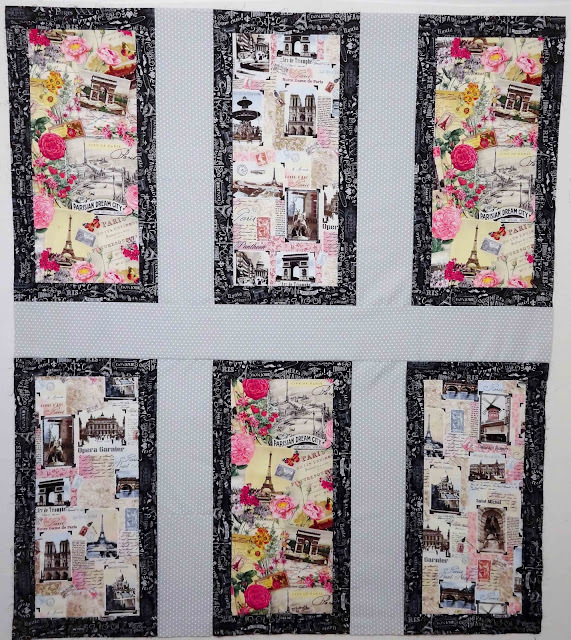 Zombies in Paris needs a back, Poinsettias is two border strips short of being a finished flimsy. Allietare would be a finished project if the binding gets done. So I could pick any one of those as a goal for this month. But with the shoulder issues that have been plaguing me, it's possible I won't be able to sew much this month. Something easy would probably be advisable. Zombies is number 1 of 4 finishes needed before May 2017. All the fabric has been purchased for project number 2 and I've finally decided on the final layout for it. September's goal is to get this quilt started. A quilt is "started" when I begin cutting the fabric for it. So this month's goal has a pretty low threshold. I'm hopeful that some stitching will get done on this project before the end of the month. I'll continue to work on Zombies and Poinsettias in the background. Maybe I'll even get to Allietare before the end of the month. 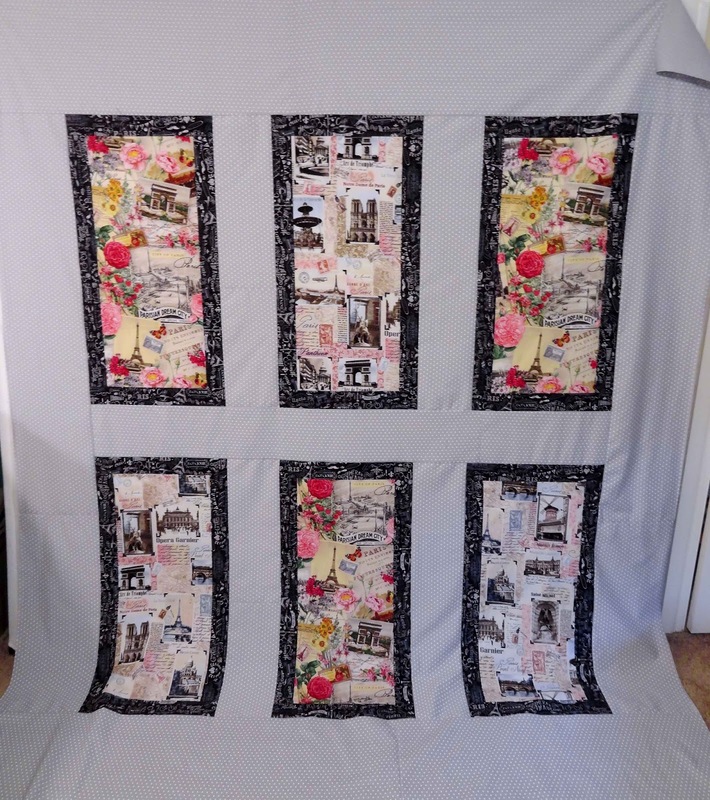 It would be nice to get another finish in before Zombies and Poinsettias come back from being quilted. What are your plans for September? Linking up with Heidi of Red Letter Quilts for the September goal kick off. 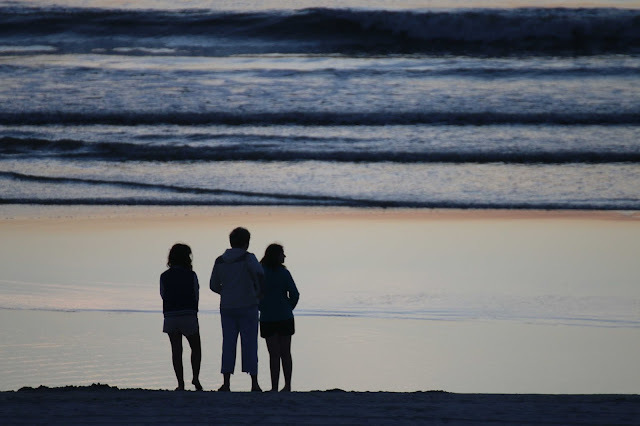 Welcome to Life in Pieces, my home in the blog sphere. Here, I share my love of quilting and photography, along with the occasional tale about Drama Teen, My Guy. Please ask permission before using photographs posted on this blog. Thanks! An award free space. Though I truely do appreciate the acknowledgement, the best award is that you come back regularly, read, enjoy and leave comments.